I can think of little else more melancholic than doing work spreadsheets and drinking a can of beer alone at 10.45pm. Frightened Rabbit are one of those few things that threaten to be more melancholic than my current plight. Their mix of emotionally devastating lyricism and quietly hopeful instrumentation is a joy in its own way. Here, they offer up a free Christmas download/single of sorts, 'She Screams Christmas'. We only just posted two new tracks from Frightened Rabbit, 'The Woodpile' and 'Dead Now', but they're back for more. Of course, they have previous form with Christmas singles/songs - the excellent 'It's Christmas So We'll Stop' comes to mind, with its similarly excellent choir-only version. 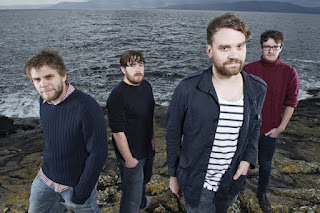 I'm not 100% sure we can call this a Frightened Rabbit track seeing as it mainly features frontman Scott Hutchison - as well as coming with his own personal request asking fans of the track to donate to Cystinosis Foundation UK, a charity that helps his niece Morven. Regardless, it's another beautifully heartfelt offering. The band seem in a rich vein of form that we hope continues with February's new album, 'Pedestrian Verse'. Download 'She Screams Christmas' from the Soundcloud widget above. Find out more at frightenedrabbit.com.